I (Leah) used to hate macaroni and cheese, especially the boxed orange kind. I’ve mentioned before how I am not a huge fan of cheese on its own, and I used to be even worse about it when I was younger (yes, this is definitely an unpopular opinion). So, it’s not surprising that a dish focusing on cheese was never something I was interested in. But, tastes change over the years, and I can now say that I like macaroni and cheese. It may not be my favorite meal, but I enjoy having a serving of it every few months. 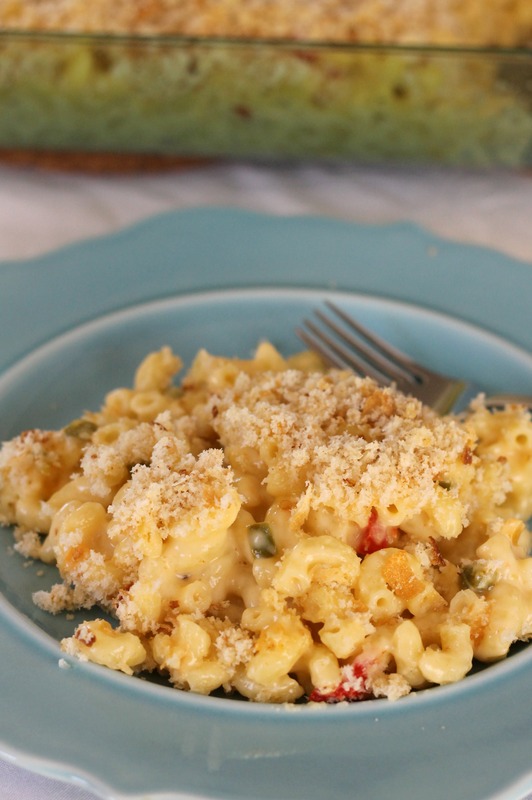 We’ve made some “fancy” varieties of mac and cheese recently, and this recipe is definitely one of our favorites. I love nearly anything with jalapeno, so this meal was sure to be a winner. It’s only mildly spicy, so if you wanted it to be spicier you could add another jalapeno or some red pepper flakes/cayenne pepper. Bring a large pot of water to boil. Cook the pasta according to the directions on the package. Meanwhile, melt ½ tablespoon of butter in a small skillet or small saucepan over medium-high heat. Add the onion, red pepper and jalapeno to the skillet and cook, stirring occasionally until tender, about 5-7 minutes. Remove from heat and set aside. In a medium saucepan, melt 4 tablespoons of butter over medium-high heat. Whisk in the flour. Cook, whisking constantly, until it turns a light golden brown and begins to foam, about 2 minutes. Whisk in the milk. Cook the mixture, whisking frequently, until it begins to bubble and thicken, about 5 minutes. Reduce the heat to medium-low and stir in the spices (add the 1/4 teaspoon of cayenne pepper, not the dash). Add the cheeses to the mixture and whisk until completely melted. Remove the mixture from the heat. Preheat the oven to 375° F. Grease a 3-quart casserole dish. Return the drained pasta to the large pot. Add in the cooked vegetables and the cheese sauce and stir until easily combined. Transfer the mixture to the prepared casserole dish. Use a food processor to pulse the bread into coarse crumbs. Transfer the crumbs to a small bowl. Melt the remaining 2 tablespoons of butter and toss with the bread crumbs. Add a dash of cayenne pepper. Sprinkle the crumb mixture evenly on top of the pasta. Bake for 25 minutes, or until the mixture is heated through and the topping is golden brown. Let stand 5-10 minutes before serving. Enjoy! Note: we think it would be fine to substitute 4 ounces of panko breadcrumbs for the bread to simplify the recipe.